Deb's Cup of Tea: It is what it is. This will be something of a rant. If you are one of the people who responded to my Facebook post with what I am about to discuss, I am sorry if I offend you. I think you don't mean to not understand, but you don't and I'm going to try to help you understand. The Jeep is not well. As I said yesterday, the brake light came on. They fixed the flat and did the oil change and then tried to determine why the brake light came on. They discovered there was no brake fluid. None. How I was able to continue to stop, they have no clue. I admit that the brakes felt a little "slow" but I also know that it's been awhile since I had any brake work done so I felt maybe things were out of alignment or something. Secondly, there was little coolant in the reservoir. There had been a leak last year, but I had refilled the reservoir twice and it was fine. I do admit to not checking after April, but I didn't notice anything awry. My mechanic flat out told me, even raising his voice at me, that the car was not safe to drive particularly because of the no brake fluid issue. Without knowing where the leak is, because he said it never just evaporates, they could not guarantee I would have brakes to get home or get back to them, even though they refilled the brake fluid. The master cylinder on the right side was rusted so they couldn't take that off to see if the leak was in there. They sprayed it with goop and hoped by today, they could get it open. It was way after 5:30, by the time they explained the problems to me. I had no money on me for a taxi. I desperately wanted to drive my car, but felt that knowing what the problem was would make me really nervous. My mechanic is a good 6 miles from my house, but I honestly thought of walking home. I could have walked to Pam's, I realize, in the light of morning. But, last night, I wasn't thinking particularly clear. As it was, Debbie from the shop, gave me a ride home. I have reviewed my finances, indeed, I did that repeatedly over the course of the evening. I have $400 in hand for repairs. Anything more would have to come on Friday when I get my paycheck. Anything more cuts dramatically into available funds to pay my bills. This then digs the hole deeper. Several well-meaning friends have said, "Gee Deb. It's time for a new car." If you have been a long time reader, you are, or should be, aware that money is beyond tight. I have friends who know this all too well from their life situation. First of all, I would need a trade in. 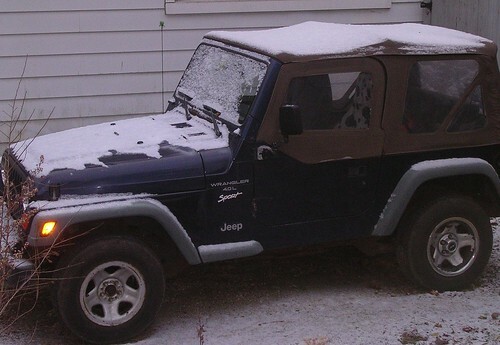 According to the Kelly Blue Book online, my Jeep would fetch me $2500. I have no additional funds, short of taking more from my meager retirement account, to contribute to this. Second, I cannot, absolutely cannot, have car payments. I missed paying my Discover bill this month. It got stuck in with a letter from a charity I would love to support, but cannot. Therefore, I have service charges and a double payment to make on that. I knew, at the end of last month, I couldn't pay it when I did my bills but I could have paid it on time later in the month, had I not screwed up the filing of my bills to keep things in order. A newer car is out of the question. Period. And what do I do about just the run-of-the-mill life things? I was going to go grocery shopping. I can't. What if my car just simply isn't fixable? I can walk to work every day. It's a little over 2 miles one way. The "rules" for working here are that you must have a working vehicle. Would I lose my job because I am out a vehicle? Not likely, but I would be told to get a car as soon as possible. I would have to rent and that gets back to having no funds in the first place. It would be a bit before I could get a working vehicle and that assumes they would take the Jeep in trade. If not, I have to junk it and then can only spend what the salvage value is. I know you mean well when you say, "Time for a new car", but you don't seem to understand the reality of my situation. Maybe my house of cards would have collapsed over the winter anyway, but 5th 3rd blew it all in back in October and knocked down in April what I had worked to repair. I have my last anti-inflammatory pill for tomorrow. I will be back to no money for the co-pay on the doctor visits. If my shoulder acts up, well, it acts up. I currently have kitty litter and cat food. They will be fed before me. I will go without. I need to scrape up some money to pay Zeke for mowing the lawn. Thankfully, he understands I don't want putting green looking so he only mows it when it gets shaggy. I currently owe him $50. I will pay him before paying someone else. It is what it is. If I needed an impetus for stopping the paper, this is it. That money can be used elsewhere. Plus, a friend called last night and has offered to save her papers and I can get them once a week. My game, where I tried to lose myself and not think of things but failed last night, is paid up through October. I need to pay for Internet access so I can still play it so that is high on the pay priority. To say that I spent quite a bit of last night in tears is a slight understatement. Carole called with a car suggestion which we will investigate. She was upbeat where I was not. "It always works out, mom." I wish I could share her optimism. I kept telling myself that worry wouldn't make anything better. I know this but it's impossible to keep that wolf at bay. Another friend suggested selling stuff I don't want on eBay. I would need dedicated help to get that going and the chances of me selling enough stuff to make it worthwhile are slim. I have a couple of other avenues to explore. My water bill went up $1.40 per month and my house payment did its ever escalating climb due to higher taxes. That's an additional $59 a month, not to mention I skipped June's payment in an attempt to get caught up. I was able to get close, but not close enough. Now, I have that to make up. And because I can't pay everything on time, there are the service charges. I don't splash this on my blog to elicit pity or even ask for help. It is what it is. I have learned to simply be in the moment. The worry that I won't be able to pay for whatever repairs they attempt is real but it is what it is. I will simply have to do the best I can. Please don't tell me I need a new car. I need a lot of things. I'm really, really low on hope and optimism and if you can tell me where to find those items free, I would be grateful. I let my "luck journal" lapse back in May so I resumed that last night only to remind myself that in spite of things looking very bad right now, I do have small pieces of luck. The basement was 95% dry this morning. That is one good way to start out the day.